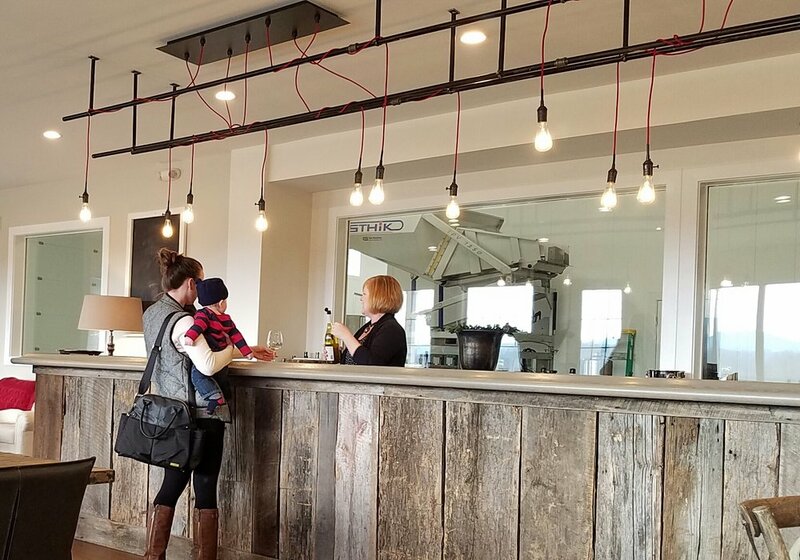 Greenhill Winery unveiled a new tasting room this winter, an airy, rustic chic space that provides more room indoors for standing and seated tastings, an expanded charcuterie and cheese plate menu and their popular music performances. In addition to tasting space, the newly constructed development at the Middleburg, VA winery includes larger space for wine making, rooms for stainless steel and French oak barrel aging, case storage and an upper-level room for exclusive use by Wine Club members. "We designed the space to accommodate the increasing demand for event and small meeting space and our own wine dinners which we love doing," explained Mary Long, Greenhill's tasting room manager and a enthusiastic champion of Greenhill wines. Greenhill produces 5,000 cases a year, and with ninety-five percent of their sales on premise, developing increased visitor and event space was a priority, as well as increasing ameneties for Wine Club members. The stunning Barrel Room is lined floor to ceiling with oak paneling and has a pitched ceiling with flying wood buttresses. Greenhill has been using it for special dinner events and receptions, including a special Valentine's Day seated dinner. The new space features rustic antiques, comfortable seating and modern artwork by artist Isabelle Truchon. Upstairs, the Wine Club members room also has a private conference room available for business meetings. Wine Club members gain access to the club by purchasing a case of wine. The Manor House, a old stone building down the drive overlooking a pond is also available to Wine Club members for tastings, outdoor space for picnics in more temperate weather and has space available for events as well. 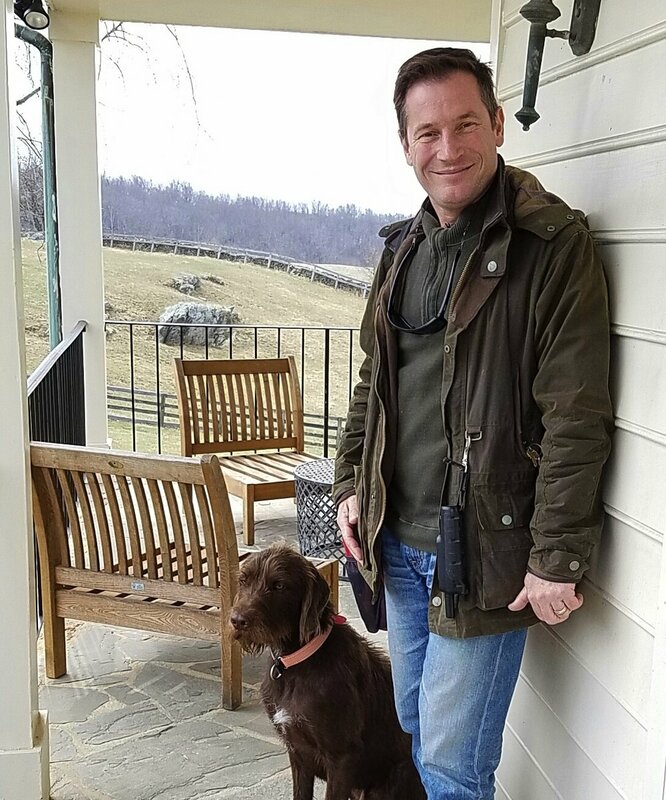 The EdibleDC team was thrilled to hear that Greenhill's previous tasting room will have a new life as The Farm Store, which will feature grassfed beef from Greenhill's own herd of Charolais cattle, but other local Middleburg area farm products as well such as eggs, honey, baked goods and produce. Expected opening date will be in Spring 2017. Who doesn't love the idea of tasting wine, picnicking and taking home fresh food from Virginia farms? Greenhill winemaker Sébastien Marquet and his dog, Ilus, a poodle-pointer mix. We bumped into winemaker and native Burgundian, Sébastien Marquet, who has been with Greenhill for the past three and half years, overseeing the production, restoration and replanting of vines for David Greenhill, the vineyard's entrepreneurial new owner. An oenologist with over twenty-five years of experience crafting award-winning wines, Marquet explained that re-pruning the original 30-year old vines created a better, more focused yield and that the new owner had also put additional land in Virginia under vine near Charlottesville, a production-only facility called Naked Valley. Tasting through the whites and reds that speak of the Virginia terroir and a top notch French winemaker is a wonderful way to spend the afternoon. Make sure and try Greenhill's sparkler and Michele Obama's favorite, Greenhill's Seyval Blanc, a French-American hybrid that is well suited for the mid-Atlantic climate and makes a crisp, lively white in the style of Chenin Blanc or Chablis. Seated or counter tastings are available for walk-ins or for reservations for $14 pp, which are recommended for groups larger than 4. For more information on events or event space, contact jennifer@greenhillwinery.com and for more information overall, visit the vineyard website at greenhillvineyards.com.